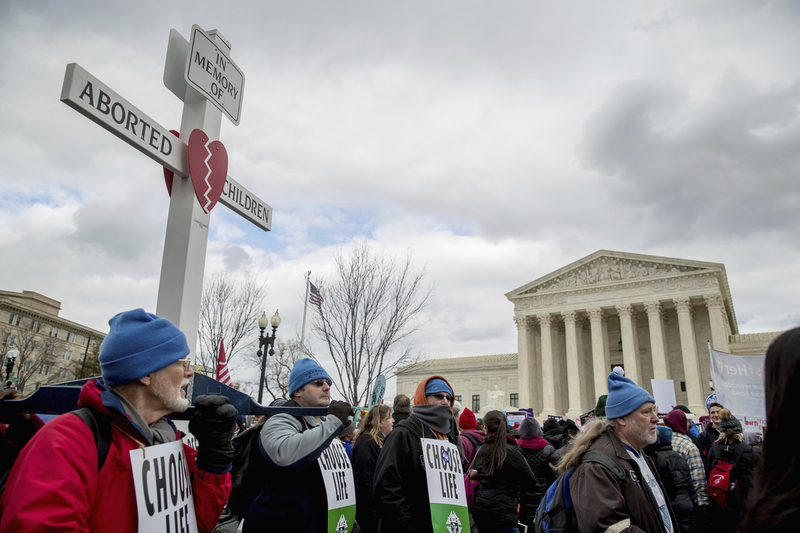 Abortion And Freedom Of Speech: A Volatile Mix Heads To The Supreme Court The high court heard arguments on whether anti-abortion pregnancy centers, which can often appear to be abortion clinics, have to disclose more fully what they are, as required by California law. Anti-abortion activists protest in the rain in front of the Supreme Court. The court is hearing arguments Tuesday on the state of crisis pregnancy centers. Supreme Court justices on both sides of the ideological spectrum expressed skepticism Tuesday about California's "truth-in-advertising" law requiring anti-abortion clinics to more fully disclose what they are. The anti-abortion "crisis pregnancy centers" objected to the law on free-speech grounds. While some more liberal justices appeared receptive to the state's case initially, doubt about the law seemed to increase as the argument progressed. Justice Anthony Kennedy, potentially the swing justice, said the law in certain circumstances would seem to impose an undue burden. He cited a hypothetical example of a billboard in Los Angeles with the words "Choose Life," paid for by an anti-abortion clinic. Under California's law, would the ad have to include, as the statute says, the words about the clinic being unlicensed, in large font and in multiple languages? Yes, it would, said the lawyer for the state. For Kennedy, that seemed to be too much. That, he seemed to say, ended the case for him — the statute is unconstitutional. The case before the justices pitted the right to know against the right of free speech. On one side are self-identified "crisis pregnancy centers" that seek to prevent abortions, and on the other side is the state of California, which enacted a law to ensure that these centers do not intentionally or unintentionally mislead the women who walk through their doors. Supporters of the California law call the state's effort nothing more than seeking "truth in advertising." But anti-abortion pregnancy centers see the law as unconstitutional, compelling speech that turns them into mouthpieces for a government message they disagree with. Passions run high when it comes to abortion. Add the fact that most anti-abortion pregnancy centers have a firm Christian perspective, and you have quite a volatile mix. The impetus was two-fold — first, allegations that pregnancy centers opposed to abortion were using deceptive practices; and second, concern that lower-income women, in particular, weren't aware of the free pregnancy-related services California provides, from prenatal and delivery care to birth control and abortion. The FACT Act requires unlicensed crisis pregnancy centers to post a sign or otherwise disclose to their clients in writing that the center is not a licensed medical facility and has no licensed medical provider who supervises the provision of services. The disclosure requirement extends to advertising, which anti-abortion pregnancy centers object to as an attempt to "drown out" their message. The state sees the law as a public health measure to ensure that women know when they are entering an unlicensed clinic and that they know the state provides free access for prenatal and delivery care as well as for contraception and abortion services that clinics opposed to abortion do not provide. In contrast, anti-abortion clinics see the California law as unconstitutional because in the case of licensed clinics, it requires them to point patients to clinics that engage in practices they oppose. In addition, they see the declaration of unlicensed status as drowning out their message. The second provision of the law, dealing with licensed centers, requires clinics that do not provide a full range of reproductive care, including services covered by Medicaid, to post a sign that says the state provides free or low-cost access to prenatal care, birth control, and other reproductive care, including abortion. The sign is to include the phone number of the county social services office for referrals. But licensed centers do not have to post the notice in their advertising. Anti-abortion activists converge in front of the Supreme Court last year during the annual "March for Life." Inside the Supreme Court chamber, lawyer Michael Farris, representing the anti-abortion clinics, told the justices that California's law "took aim at pro-life pregnancy centers by compelling licensed centers to point the way to an abortion and imposing onerous advertising rules on unlicensed centers." Justices Ruth Bader Ginsburg, Anthony Kennedy and Sonia Sotomayor observed that the court has in the past upheld laws enacted by "pro-life states." In the 1992 case Planned Parenthood v. Casey, the court upheld laws that require doctors to tell women seeking an abortion about alternatives, including telling the pregnant woman that the father of the child would be liable for child support. As Justice Elena Kagan put it, "They're really the exact flip side of the requirements in this case." Therefore, the justices asked, why shouldn't a "pro-choice state" require anti-abortion clinics to tell women that there are other options, including contraception and abortion. Farris said California's law is different, because it involves clinics that provide medical procedures. Justice Samuel Alito asked, what if the state required all clinics to post a referral notice advising patients where they can learn about all their options. Farris said that was still unconstitutional. "In law ... what is sauce for the goose is sauce for the gander," Justice Stephen Breyer observed. "If a pro-life state can tell a doctor you have to tell people about adoption, why can't a pro-choice state tell a doctor ... you have to tell people about abortion?" The tone of the argument turned, however, when Justice Kennedy raised his billboard hypothetical. Requiring unlicensed clinics to disclose their status on such billboards, he said, would pose an "undue burden" and "should suffice to invalidate the statute." Other justices seemed to agree, including Justices Sotomayor and Neil Gorsuch. Justice Ginsburg noted that the disclosure, which in multi-ethnic Los Angeles is required in 13 different languages, can be "very burdensome." However, Justice Sotomayor also pointed out the advertising practices of some of these unlicensed clinics. She observed that on the Fallbrook Pregnancy Resource Center's website there is "a woman on the home page with a uniform that looks like a nurse's uniform in front of an ultrasound machine." The site further states, "Fallbrook will educate clients about different abortion methods available, and describe in medical terms different abortion procedures." The website also indicates that Fallbrook follows all HIPAA regulations. "If they're not a medical provider, they don't have to follow HIPAA," noted Justice Sotomayor. 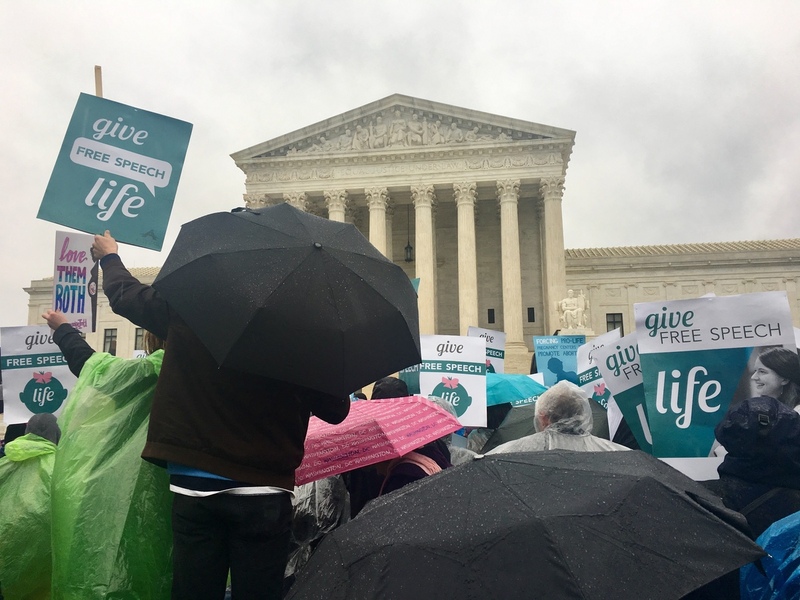 Defending the law, California's deputy Solicitor General Joshua Klein told the justices the law was not targeted at "pro-life clinics." Rather, he said that most general clinics provide Medicaid which, in California, automatically gives women access to free or low-cost reproductive care, including pre-natal care and abortion. But Justice Alito pushed back, asking why the law applies only to clinics whose "primary function is providing service to pregnant women." He wanted to know why the law applies only to non-profits and why it exempts individual doctors. "When you put all this together, you get a very suspicious pattern," he said. If the argument proved one thing it is that there are a lot of unanswered questions about how California applies its law. Those questions are unanswered, because the case went to the Supreme Court at an early stage, without establishing the facts in a trial, and several justices suggested that perhaps the court should send the case back to establish an evidentiary record as to how the law is applied. Were the Supreme Court to strike down either of the law's provisions, it could well cast doubt on laws in "pro-life states" that require doctors to give extensive information about other options to patients seeking abortions. In the California case, the Trump administration has a compromise position. It supports the requirement that unlicensed clinics disclose their status to patients, but it views as unconstitutional the provision that compels disclosure about the existence of free or low-cost abortions that the state of California provides. Protecting women from deception or trampling on the "pro-life" message? "We're simply trying to make sure the recipient of health care information or advice understands exactly what he or she is entitled to in terms of services and that the information is accurate," said California Attorney General Xavier Becerra in defending the law. That is not how the anti-abortion centers see it. The law "is requiring a licensed center... that is pro-life and wants to help women choose life, point the way to an abortion," said lawyer Kristen Waggoner, who represents the anti-abortion pregnancy centers that are challenging the California law. That, she adds, "is not simply information." As for unlicensed centers, she said, there is no need to disclose the lack of a medical license. "They're not doing anything that requires a license," she said, "so why would they need to say that?" There are plenty of good reasons, replies Nancy Northup, president and CEO of the Center for Reproductive Rights. "If these fake medical centers had on their front doors, 'We're pro-life centers. We're here to help you decide to continue your pregnancy,' there's nothing wrong with that, and that's fine," Northup said. "But what they're trying to do instead is lure women in on false pretenses." In recent years, the number of pregnancy centers that counsel against abortion has dramatically increased. Today there are about 2,700 of them around the country, more than three times the number of clinics that provide abortions. And just as some states provide taxpayer funds for abortions, 14 states directly fund anti-abortion pregnancy centers. From 2001 to 2006, the centers received an estimated $30 million in federal funding. There is no data on how many of the 2,700 anti-abortion pregnancy centers are unlicensed. But unlicensed clinics offer pregnancy tests, limited ultrasounds, and, to an unskeptical eye, they can look very much like a licensed medical facility. The personnel wear surgical scrubs or white coats and ask clients to fill out medical history questionnaires. Indeed, many clinics locate next to or across the street from a full service women's reproductive health center and some use similar sounding names. Do these anti-abortion pregnancy centers deliberately locate close to abortion clinics? "I sure hope so," said anti-abortion advocate Waggoner, "because women should have both options. And they shouldn't see only a provider that has a financial incentive to get them to abort a child." Waggoner represents the National Institute of Family and Life Advocates, NIFLA, an umbrella group of anti-abortion pregnancy centers. Some anti-abortion pregnancy center personnel are even more blunt. Jacob Hall is director of services and client care at Care Net, an organization that supports crisis pregnancy centers. At a recent Care Net conference, he advised the centers on how to use search engines to identify key words for their marketing and websites, the object being to attract women searching online for an abortion clinic to an anti-abortion pregnancy center instead. "I know 'abortion pill' is something people are searching," he said. "'Abortion clinic,' 'abortion clinic near me,' 'abortion cost,'" Hall said. "Fantastic key words if those phrases are on your website. If they're not, easy, just add them. Just say, 'we're here to talk to you about abortion, including abortion pills and abortion surgery.'" At the same conference, Jana Pinson, director of a crisis pregnancy center in Texas, said she had great success with the term, "planning parenthood." Though her clinic opposes abortion, she changed her website tag to 'The Number One Source of Abortion Information in the Coastal Bend,' "because we are," she said. Brian Fisher, of Human Coalition, another group that helps anti-abortion clinics, has also advocated using these tactics to attract women seeking an abortion in hopes of derailing their plans. This sort of marketing is necessary, he argued last year, because "the abortion-determined woman will not walk into a pregnancy center voluntarily." Several women NPR contacted were infuriated by these tactics. Annie Filkowski went to a clinic because it advertised free pregnancy tests. She spent hours there before learning she was not pregnant, and when she then asked a counselor to write her a birth control prescription or give her advice on which method to use, she said the counselor told her, "Birth control causes infertility and can give you cancer" and other "crazy" things. Dartricia Walker said she went to a clinic for a pregnancy that she very much wanted. She mistakenly thought it was a medically licensed facility, and that the person who conducted the ultrasound was a nurse. Neither was true. She then had a miscarriage that a doctor later told her might have been avoided had she received adequate medical care. "I was really upset that I was given the wrong date," Walker said, "because if I had known that I was due sooner, I would have gone sooner to an ob/gyn." There are excellent clinics that oppose abortion, too. For an example of those, NIFLA, which is challenging the California law, referred us to "Informed Choices," a licensed clinic in Gilroy, Calif., that has a staff of five, including two nurses, plus a volunteer ob/gyn who supervises medical procedures, and 20 other volunteers. Christine Vatuone, the executive director, said that while the clinic does oppose abortion, and will not refer patients to an abortion provider, all patients are clearly told that they have three options: abortion, adoption and parenting — and that every room in the center has a sign with five promises: "that we will treat them with respect, that we will protect their privacy, that we will not pressure them, that we will support them, and that we will not lie to them." Still there is room for confusion about the clinic. Google "pregnancy, Gilroy, CA," and the first three results are for Informed Choices, while the fourth is Planned Parenthood. Google "Abortion, Gilroy, CA" and Informed Choices comes up too. And "on advice of counsel," the clinic does not display the mandatory language in the California law advising patients that the state provides free access to a full range of care from pre-natal to abortion. Many patients who seek out clinics that will support their pregnancy say they are thrilled with the counseling and material support clinics like Informed Choices provide, everything from food to baby clothes, diapers, car seats, and emotional support. "It just gave me that push to let me know that, you know, I can do this," said Laura Wu after visiting a crisis pregnancy center in New York. "It is possible for me to do this alone." An earlier version of this report said licensed pregnancy centers that do not have a full range of services must provide written notice that the state provides free or low-cost access to prenatal and delivery services, birth control and abortion. Although the California Medicaid program does cover labor and delivery costs, that is not specified in the written notification requirement.